PGFD Open Houses - "Every Second Counts"
Ensure your home is equipped with working 10-year smoke and carbon monoxide (CO) alarms and test them on the 1st day of every month. This year’s Fire Prevention Week theme: “Every Second Counts: Plan 2 Ways Out!” is important. It reinforces why everyone needs to have an escape plan. Draw a map of your home by using our grid in English (PDF) or Spanish (PDF) with all members of your household, marking two exits from each room and a path to the outside from each exit. • Practice your home fire drill twice a year. Conduct one at night and one during the day with everyone in your home, and practice using different ways out. • Make sure the number of your home is clearly marked and easy for the fire department to find. • Close doors behind you as you leave – this may slow the spread of smoke, heat, and fire. 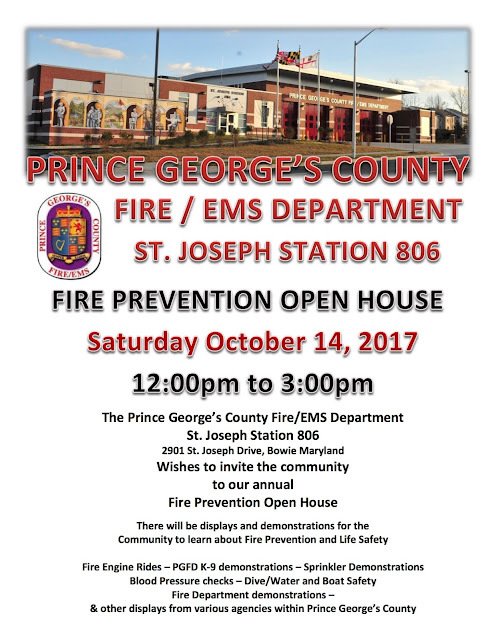 Many of our Fire and EMS Stations located throughout Prince George’s County will be hosting Open House events over the month of October. We encourage everyone to stop by and meet your firefighters and take advantage of the opportunities to learn some life-saving tips. For additional information on these events please click on the name of the Fire Station for their website.